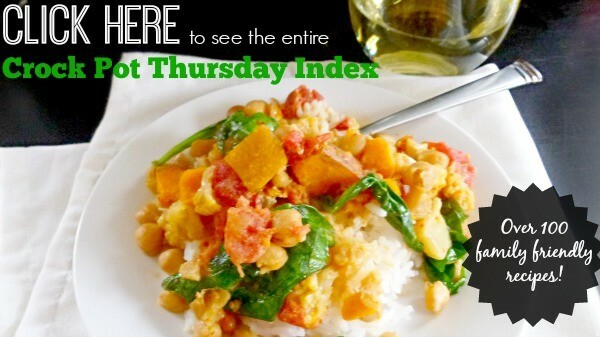 Sometimes we choose a recipe for Crock Pot Thursday that is an all out winner. Everyone loves it, and even with a few modifications based on the whims of the individual cooks, the dish turns out fantastic. 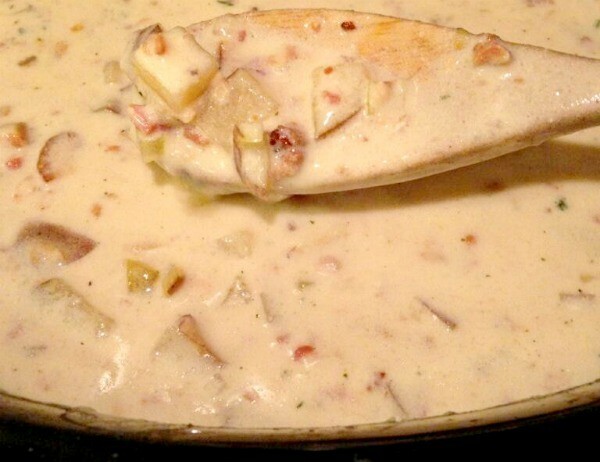 This crockpot clam chowder is one of those recipes. It’s crazy to me that in the more than two year history of weekly slow cooker recipes, this is the first clam chowder we’ve made. What an oversight! I love clam chowder. I love eating it on the docks in the summer, with the salty breeze on my cheeks and the sounds of seagulls in my ear, and I love it on dark, winter nights with a side of crusty bread. My kids love it, too, even though they claim to hate clams. They’re goofy, those two. “Mmm! This is so good!” my five-year-old daughter exclaimed over her bowl of chowder. “Do you mean corn chowder?” I clarified. “Yeah! Corn chowder!” they both hollered. Sorry, kids. This recipe is going in the rotation, and you can just pick around the good stuff. I’d be happy to take your rejected pile of clams off your hands. 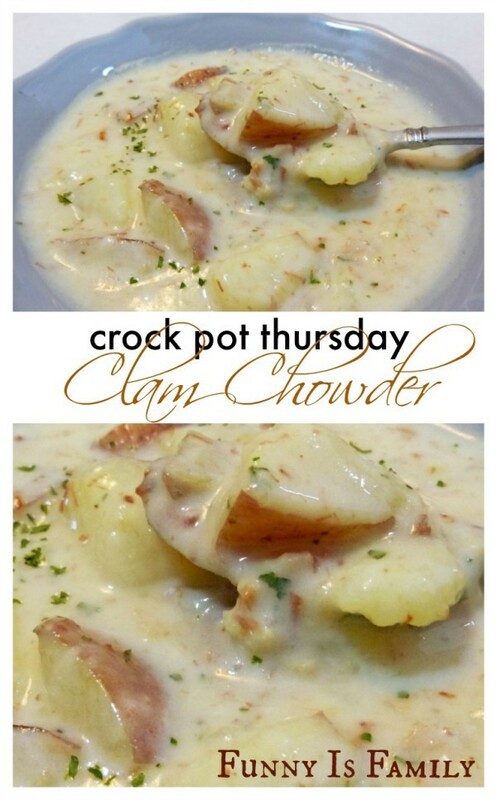 It sounds like the rest of the Crock Pot Thursday offspring loved this chowder as much as their parents did, clams and all. Sarah used russet potatoes, Linda used Yukon golds, and Kim and I used red potatoes. I left the skin on mine, and used big chunks because I felt like it. 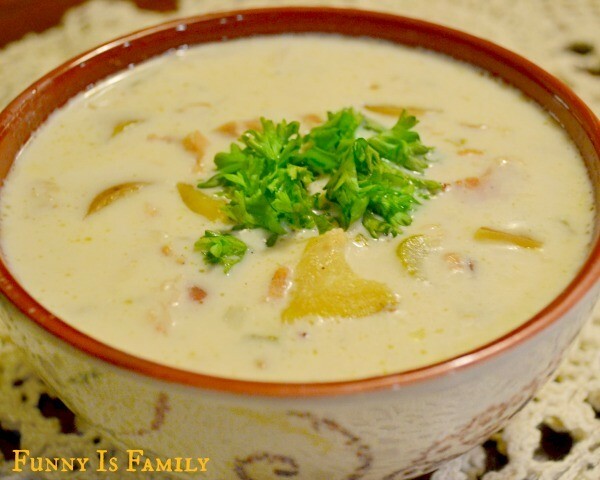 If you are in the market for a classic crockpot clam chowder recipe, give this one a spin. I’ve already made it twice! In skillet, saute bacon and onion until golden brown. Drain, and put into slow cooker. Add all remaining ingredients, except half and half (or cream), cornstarch, and parsley. Cover and cook on high 3 to 4 hours, or low 6-7 hours, until vegetables are tender. During the last hour of cooking, combine 1 cup of milk or cream with the cornstarch. Add cornstarch mixture and the remaining milk or cream and stir well; heat through. Very good chowder - you could even say restaurant quality! I cheated a little and used precooked bacon bits from a bag, which worked fine but next time I think I'll go the extra mile and see if that impacts the flavor/texture. I left the skin on the potatoes and they were great. 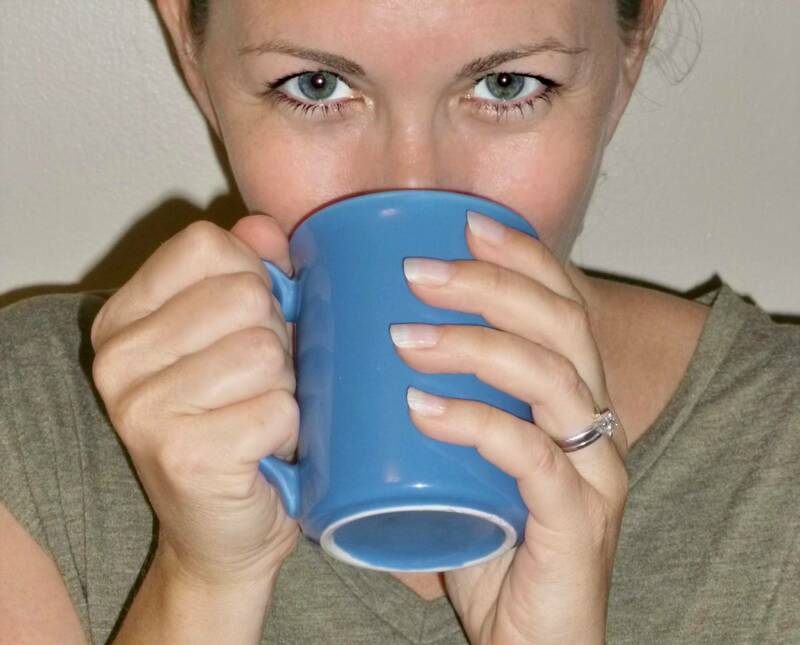 And based on reviewer feedback, I ended up using 2 cups chicken stock and 1 cup water. I would do that again. I will cop to accidentally adding the half and half at the beginning (oops) but that was remedied by cooking on low for longer and stirring occasionally, and it held up fine. I'll wait next time so I don't have to worry about curdling. We ate with sourdough bread, yum. This is a new favorite in our house! This was great! I have never made clam chowder so when this was picked I was very hesitant. It was so easy that I questioned if it could really be as good as people were saying. Let me tell you, it is! I fried the bacon with my onion and added I would do that again, I think it is worth the extra prep time. My toddler ate this pretty well and my husband and I both went back for more. I left the skin of my potatoes on too after Kim tried this with success. I also used the 3 cups water and thought that it might have been too watery. Next time I will add more cornstarch or less water. I also only bought two cans of clams and while I wish that it had all of the four cans. I thought it was still very good and most people probably wouldn't even notice. Sarah's husband, Tyler, wanted to weigh in, too. He says Sarah is "too wordy." Tastes good, too watery, needs more bacon, and all the clams. Would make again. This was delicious. We savored it to the last drop. Mine was not watery, I am not sure why. I used Yukon Gold potatoes, unpeeled-they may be more starchy than some other varieties. We will definitely make this again on these cold and wet winter days. Yummy! This was my first time making clam chowder and was surprised how easy this recipe made it. I added 1 cup of celery and fried it with the bacon and onion. I used 1½ cups water and 1 cup of chicken stock. It was just the right creaminess. I omitted the water all together, and just used 2 cups chicken stock because we like a thick chowder in our house. The grown-ups loved this clam chowder, and the kids really liked it, too, even though they don't like clams. Made this today for dinner and it was fantastic! I used 3 cups of chicken broth instead of the cup of water, sauteed celery and some garlic with the bacon and onion, added a bit of thyme and a bay leaf to the broth before the half and half and cooked it for 3 hours on high, 1 hour with the half and half. When almost done I added a 1/4 stick of butter—heaven in a bowl! I’m so glad you liked it! Thank you for taking the time to share your feedback and modifications! I really appreciate it. May I ask how many people this recipe should feed? Thank you! Do the clams come out tender?? That is the biggest complaint I have about clam chowder. I love the flavors and smell, but the biggest turnoff is tough clams. Never had tender clams yet. This recipe looks very good, however, I don’t see a wait time to add in the clams for say until the last hour of cooking so that the calms don’t get rubbery from over cooking. Has this issue with the recipe been brought up?